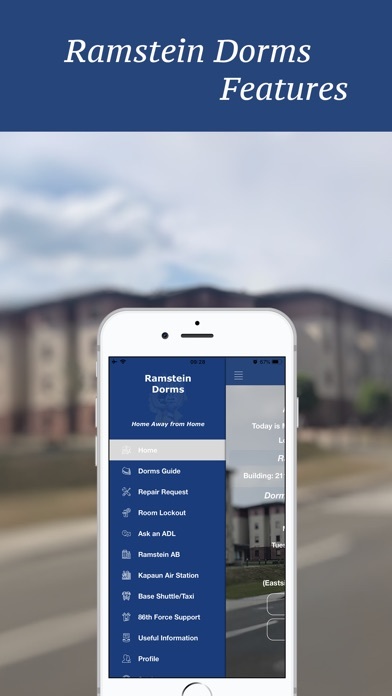 Ramstein Dorms provides Ramstein AB and Kapaun AS dorm residents with a convenient and reliable method to contact the DRC, submit work orders, and be up-to-date with any dorm related issues. 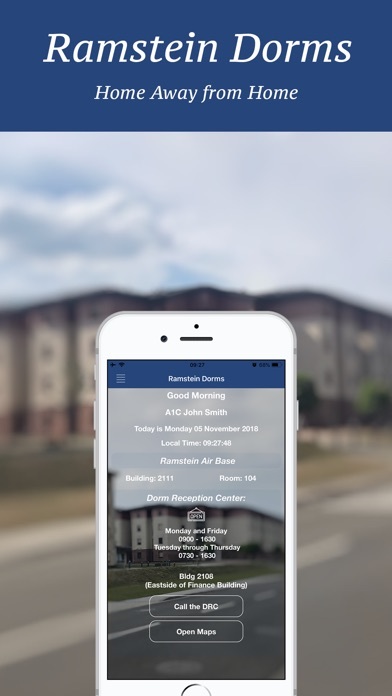 One of the problems that we are facing is that airmen are not reporting dorms issues to the DRC in a timely manner, by providing this app, airmen will be able to describe their problem with a push of a button. ***Features*** * Repair Request: Send an email to the DRC org box, describing your request. * Room Lockout: Instructions on gaining access to your room after losing your key. * Ask an ADL: Send an email to the DRC org box. * Ramstein AB: Information regarding DRC, Dfac, Postal Office, and Gym. * Kapaun Air Station: Information regarding DRC, Dfac, Postal Office, and Gym. 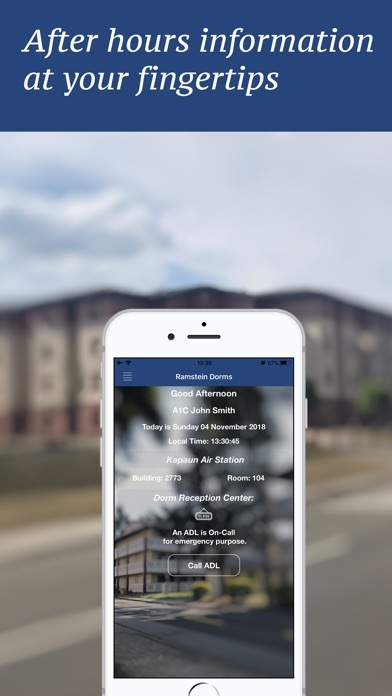 * Base Shuttle/Taxi: Information about Base Shuttle/Taxi routes and times. * 86th Force Support: Current events and announcements from the 86 FSS. 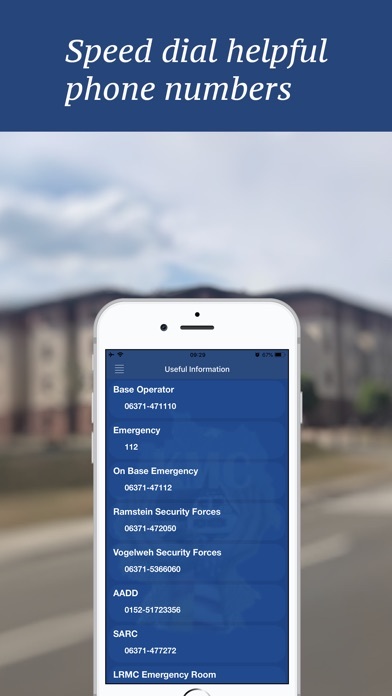 * Useful Information: Speed dial to Emergency and other helpful numbers. 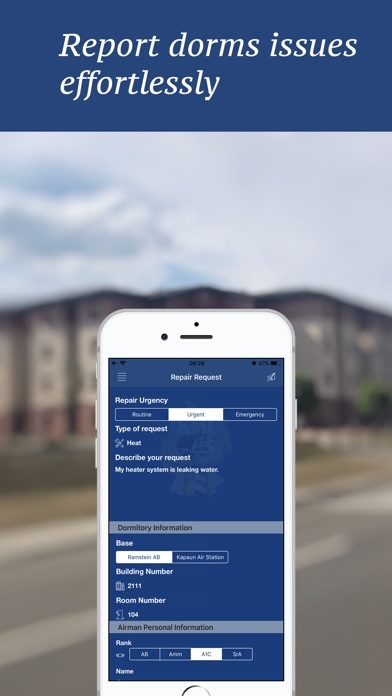 * DRC Notifications: Stay up-to-date with notifications affecting your dorms from the DRC. *** Feedback *** Your feedback is important to us, please email help.forcemobilestudios@gmail.com or visit www.forcemobilestudios.com to provide your feedback.